Aposematism (from apo- away, and semantic sign/meaning), is the word used to describe a family of anti-predator adaptations where a warning signal is associated with the unprofitability of a prey item to potential predators. 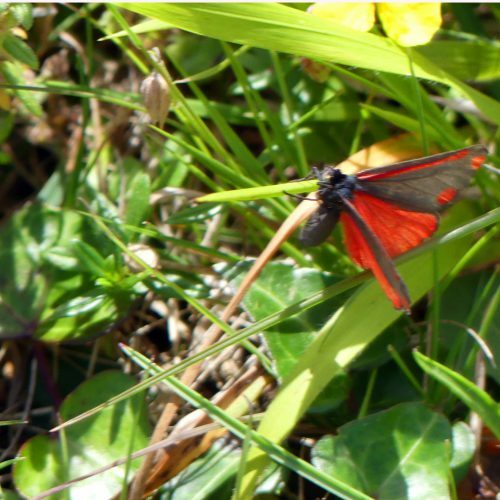 Aposematic signals are beneficial for both the predator and prey, both of which avoid potential harm. 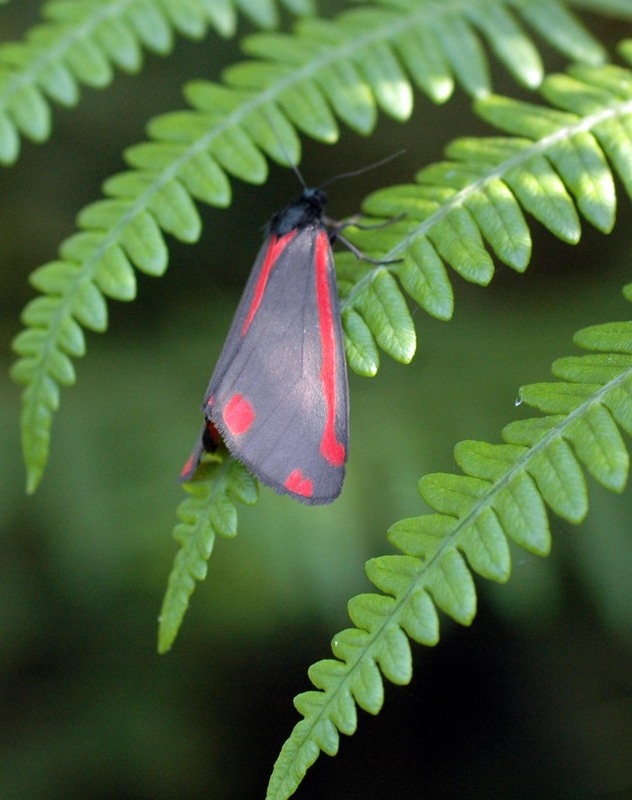 Walking on the Little Orme a few evenings ago I caught sight of a black and red moth flying across my path that landed on a fern frond. 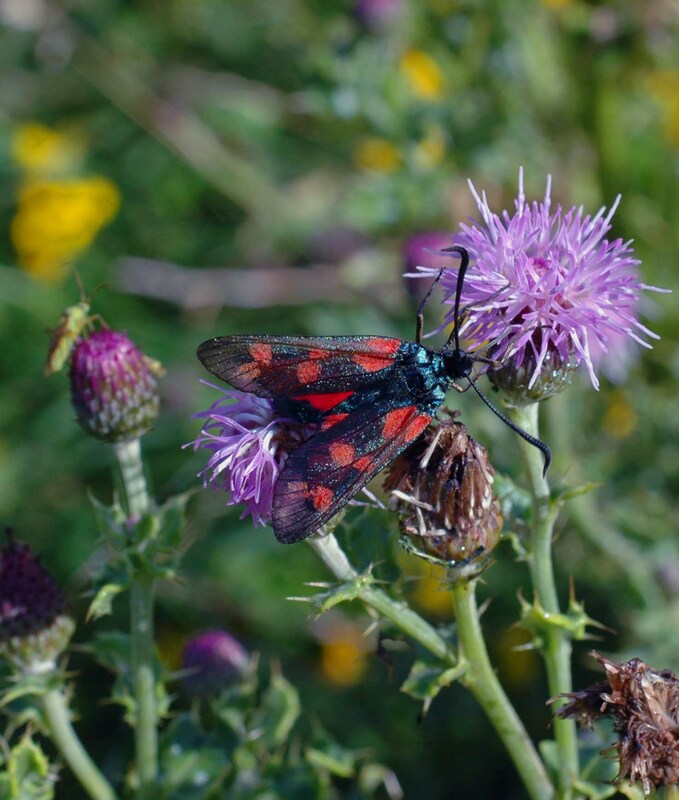 I have photographed similarly-coloured, but more spotted 6-Spot Burnet Moths within this site on many occasions, but this one was a Cinnabar Moth, which I have always kept an eye out for but never managed to see until now. This is the moth that lays its eggs on Ragwort that hatch into the black and yellow striped larva that will soon be munching on the leaves of that plant in large numbers. Flying : May – August. UK Distribution: England, Wales, Scotland & Ireland. 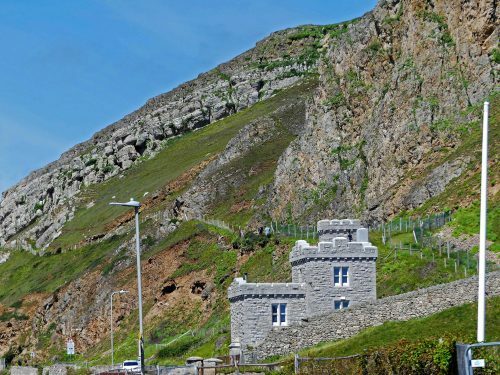 Common and well distributed throughout most of England, Wales and Ireland, the Isle of Man and the Channel Islands. More confined to predominantly coastal habitats in northern England and Scotland. 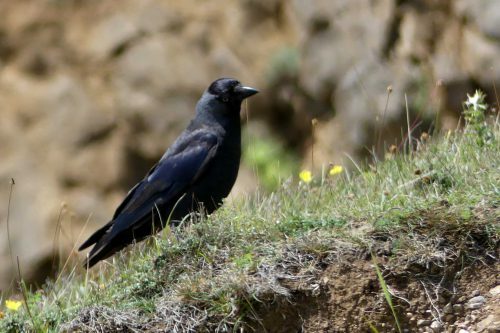 Habitat: Frequent in open grassy habitats including waste ground, railway banks, gardens and woodland rides but perhaps most frequent on well drained rabbit-grazed grassland, mature sand-dunes and heathland. 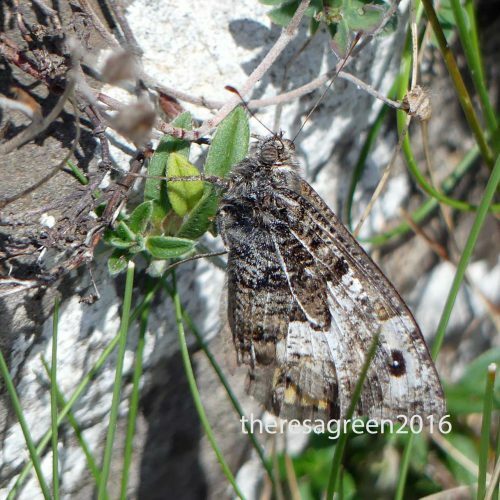 Description: Medium-sized black moth, red markings on the forewing, hindwings mostly red. Often found near common ragwort, although sometimes on other ragworts and groundsels. 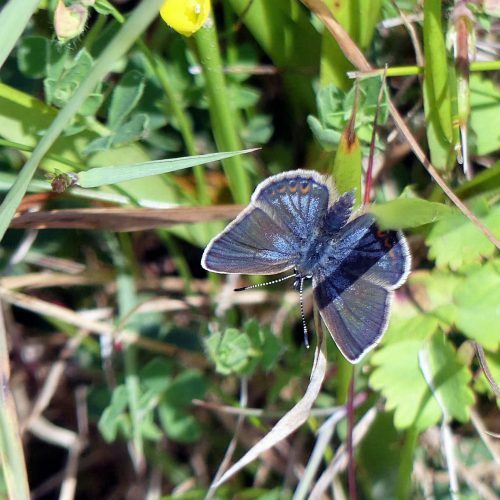 This species is so named due to the colour of the hindwings and the markings on the forewings which make it unmistakeable. 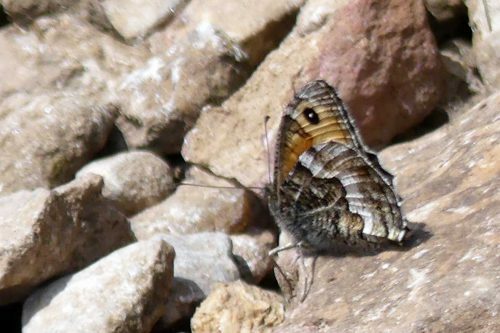 On rare occasions the pinkish markings are replaced with yellow, or the forewing is red with a black border or the wings are completely black. Easily disturbed by day and flies in sunshine. Also flies after dark. 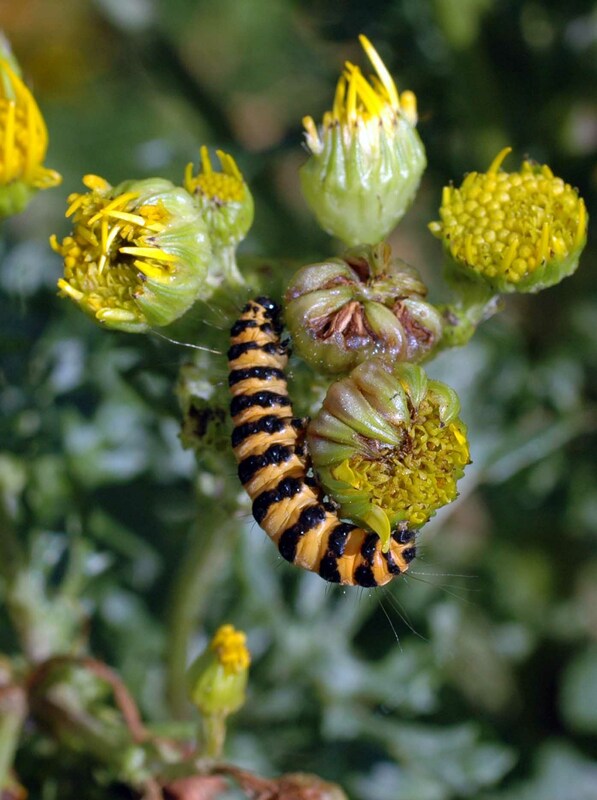 The Cinnabar larvae consumes ragwort from which it absorbs alkaloids and which it retains as an adult, making it unpalatable to predators in both forms. Flying: June-August. UK distribution: Throughout Britain, mainly coastal in Scotland. Habitat: Frequents flowery grassland, woodland rides and sandhills. Description: Medium-sized black moth with six red, occasionally yellow, spots. Burnet moth caterpillars absorb Hydrogen Cyanide (HCN) from the glucosides in their food plants: bird’s-foot trefoil and vetches. They can also synthesise HCN themselves, storing it in body cavities and excreting it as chemical weaponry. Also out and about in some numbers were Soldier Beetles. The red and black colouration reminded people of the red coats of British soldiers, hence the common name. It is also known as the ‘Bloodsucker’ for its striking red appearance, but it is harmless to humans. There are about 40 species of soldier beetle in the UK, displaying various colour combinations of black, red and orange. Description: A medium-sized, narrow beetle commonly found on open-structured flowers, such as daises, Cow Parsley and Hogweed, during the summer. 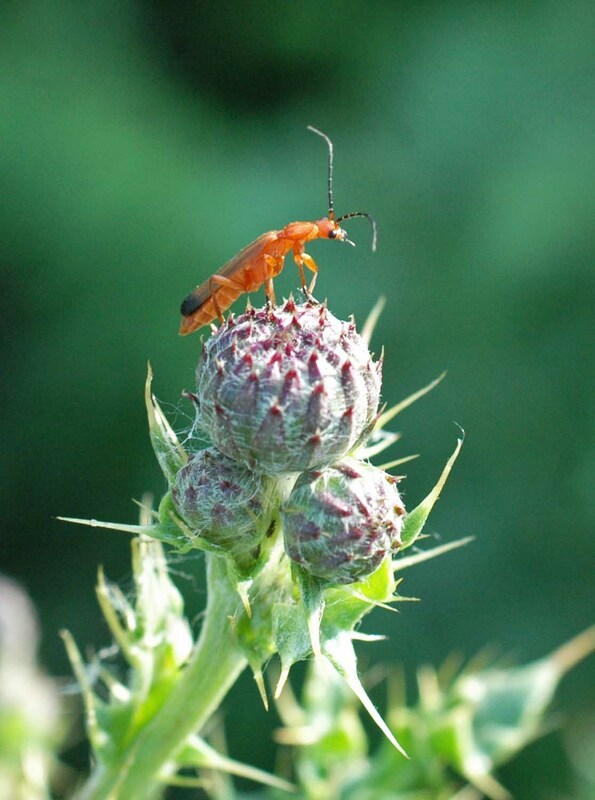 There are about 40 species of soldier beetle in the UK, displaying various colour combinations of black, red and orange. 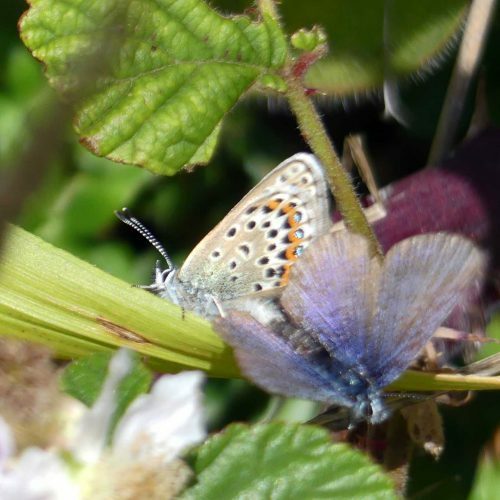 Habitat: It can be spotted flying in grassland, woodland, along hedgerows and in parks and gardens. Food: The adults are especially important predators of aphids. They supplement their diet with nectar and pollen and can be minor pollinators. Larvae prey on ground-dwelling invertebrates, such as slugs and snails, and live at the base of long grasses. 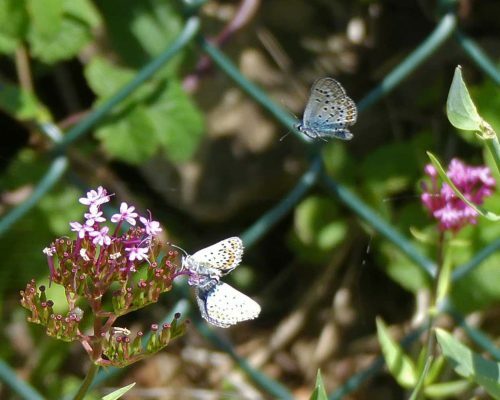 Behaviour: The adults spend much of their short, summer lives mating and can often be seen in pairs. Then there were ladybirds, more than I’ve seen for a long time in one place and I was reminded that there was a ladybird plague in England one very hot summer. I looked it up and it in 1976, prompted as a response to a marked increase in aphid populations. There were many reports of people being bitten as the supply of aphids dwindled. That could happen again this year if the hot dry weather continues; I’ve already seen a lot of aphids…. The seven-spot is easily one of Britain’s most common and easily recognised beetles. The beetle’s common name “ladybird” originated in Britain where the insects became known as ‘Our Lady’s bird or the Lady beetle. Mary (Our Lady) was often depicted wearing a red cloak in early paintings, and the spots of the seven-spot ladybird (the most common in Europe) were said to symbolise her seven joys and seven sorrows. In the United States, the name was adapted to “ladybug”. Coccinelid is derived from the Latin word coccineus meaning “scarlet”. Another insect that employs the colour combination of red and black to advertise to predators that they taste horrible: if they are attacked, (or picked up), they exude an unpleasant yellow substance (reflex blood) from their leg joints which is rich in toxic alkaloids. A threatened ladybird may both play dead and secrete the unappetizing substance to protect itself. 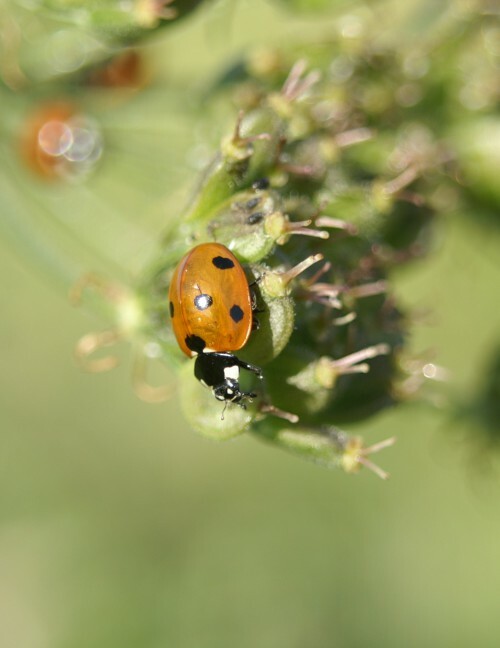 Ladybirds lay hundreds of eggs in the colonies of aphids and other plant-eating pests. When they hatch, the ladybird larvae immediately begin to feed. 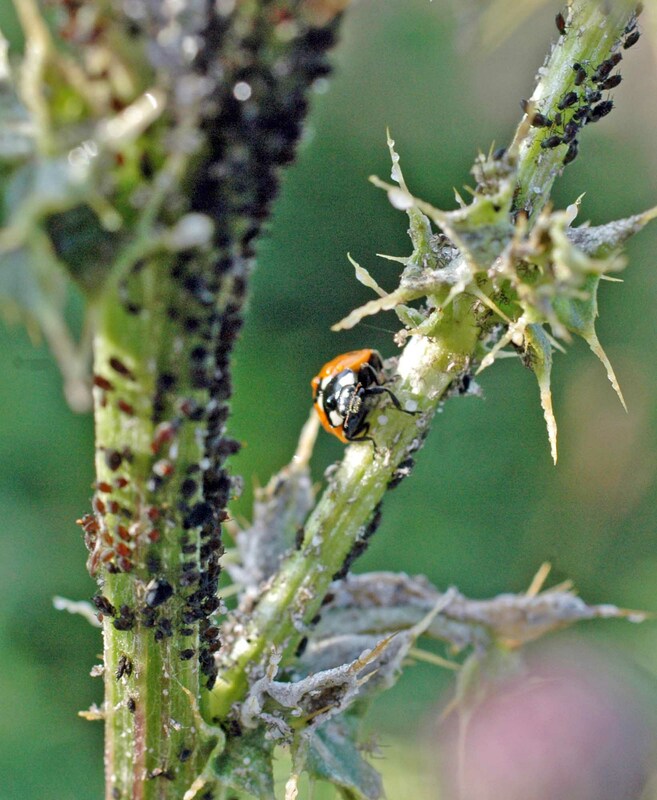 Seven-spot ladybirds are avid and very active aphid predators, devouring more than 5,000 during their year-long life. There are 46 species of ladybird resident in Britain and the recent arrival of the harlequin ladybird has the potential to jeopardise many of these. The atlas Ladybirds (Coccinellidae) of Britain and Ireland published in 2011 showed a decline of more than 20% in native species due to environmental changes and competition from foreign invaders. The distribution maps, compiled over a 20-year period with help from thousands of volunteers, showed a decline in the numbers of the common 10-spot and 14-spot ladybirds and a number of other species, including the 11-spot, 22-spot, cream-spot, water and hieroglyphic ladybirds, Coccidula rufa, Rhyzobius litura and Nephus redtenbacheri. Conversely, increases were seen in the numbers of harlequin, orange, pine, and 24-spot ladybirds, as well as Rhyzobius chrysomeloides. As I got older I acquired a collection of ‘Ladybird’ brand books, which are still produced today. And I seem to remember there was a Ladybird children’s clothing range too.